DON’T LET LIFE’S MANY OBSTACLES STOP YOU FROM REACHING YOUR GOALS…WE CAN HELP! The Council for Economic Opportunities in Greater Cleveland is here for you! 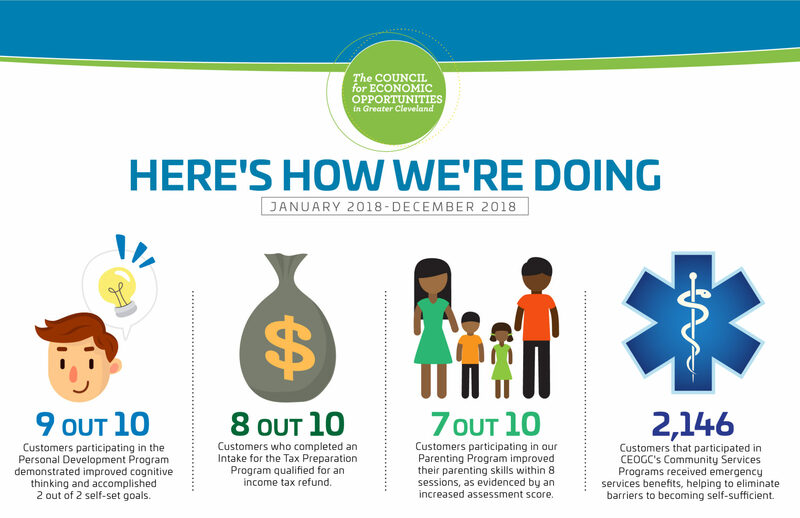 Our services are designed to empower low-income families in Cuyahoga County by eliminating barriers and assisting individuals to become self-sufficient. We believe that your mental health is just as important as your physical health. CEOGC accepts walk-ins and referrals! We offer many services: taxes preparation, Baby and Mommy Support (B.A.M.S), Emergency Assistance, Parenting workshops, Counseling, Life Skills, Anger Management workshops and Domestic Violence workshops for men. These services are available for free for income-eligible Cuyahoga County residents. We understand that many people need support with dealing with their feelings and emotions so we have Licensed Social Workers on staff who are trained to help you deal with your daily stress. We take appointments and walk-ins Monday through Friday from 8:00 a.m. until 5:00 p.m. Just call or stop into one of our three locations: downtown Cleveland and on the East and South sides. We’re glad to report how we’re doing! Like paying heating bills, getting warm clothes or food. Going back to school, getting a better job, etc. Make referrals to one of our community partners for help with anything from learning a new skill to conquering drug addiction. Free income tax preparation assistance to help you receive what’s yours. Learn to rein in emotions and cope with life’s challenges in a healthy way.